Sternwheelers line the Pomeroy riverfront during the 2016 Sternwheel Riverfest. 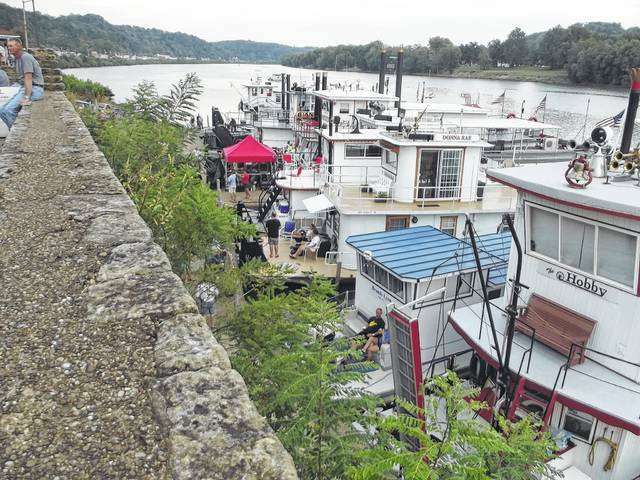 POMEROY — Pomeroy’s Sternwheel Regatta will take place Sept. 22 and 23 under the direction of a new team of organizers. Earlier in the summer it appeared as though the annual Sternwheel Festival would not be taking place this year as the previous committee decided to cancel the event due to the lack of volunteers. In early August came word that the festival, renamed as the Pomeroy Sternwheel Regatta, would take place a week later than the original date and would be organized by the Pomeroy Eagles. John Lehew, himself a sternwheel boater, is heading up the group from the Eagles to keep the event going for this year. At a recent planning meeting, Lehew said that the event would possibly be expanded back to three days next year when there is additional time for planning of events. For this year, the event will take place on Friday evening and all day on Saturday on the Pomeroy Parking Lot and in the downtown area. One of the new events this year will be the Poker Walk at several of the downtown businesses. Registration for the walk runs at 9-11 a.m. at the Eagles, with the walk stopping at seven area businesses between 11 a.m. and 4 p.m. The final stop is the Eagles by 4 p.m. Currently, there are more than a dozen boats confirmed to attend the event, with the boats expected to start arriving early in the week leading up to the event. The Brandy Lynn has been owned by Andrew and Emily Barr with Scott and Kathy Barr since 2015. The Brandy Lynn’s home port is Nitro, West Virginia on the Kanawha River. The Centennial was built by Everett Ruble Jr. in 1976. The Centennial once carried people to and from Blennerhassett Island. It was converted to a live-aboard boat in 2012. The Dixie is a small version of the famous Delta Queen. Built in 1937 it has changed ownership several times. In 1998, it was sold to Captain “Heck” Heckert and Sheila Diane Heckert and has been restored as a modern day structuring of the original Dixie of 1937. John and Cheryl Thomas of Syracuse, Ohio, built the Faris Wheel Sternwheeler. John spent two years building the boat and completing it in 1996. The current owners, Tom and Loretta Faris, purchased the Faris Wheel in 2001. The Faris Wheel is docked at the Gallipolis Boat Club on the Chickamauga Creek in Gallipolis, Ohio. The Hobby III is owned by J.D. and Becky Pauley with her home port being the “Port of Indecisions” in Nitro, West Virginia, on the Kanawha River. The Hobby is a wooden structure with the lower cabin and includes a full bath and complete kitchen. It is even equipped with central air and heat. Owned by Melvin and Donna Lawrence, the Iva Ruby has a home port of Buffington Island in Portland, Ohio. The Iva Ruby was previously known as Don Rob’t and was built in 1970. It features a gingerbread-trimmed pilothouse and eight leaded stained glass windows. The Juanita is owned by Tommy and Larkin Cook of Dunbar, West Virginia. The sternwheeler was built in 1954 and has since had extensive renovations inside. The Kanawha was built in 1937 and is currently owned by Duke and Christy Grant. The Grants have made several changes and renovations to the Kanawha. The home port is Nitro, West Virginia. The Lida Ann was built in 1926 and served as an open-air passenger ferry. In 1986, it was converted to a side wheel vessel. In 2004, the Lida Ann was purchased by Captains Josh and John Scott. The home port is Charleston, West Virginia. The Miss Sterling was built in 1926 and is currently owned by Kris Eads of Dunbar, West Virginia. Extensive renovations have been made to the Miss Sterling. The Pearl Anne was built in 1987 and was originally named the Oh Susanna. Kris Eads and Tabitha Stutler purchased the Pearl Anne in 2007 and changed the name to what it is today. Brannon Eads purchased the boat in 2014 and renovations were again made to the Pearl Anne. The home port is South Charleston, West Virginia. The Port Explorer is owned and built by Steve and Bonnie Hutchison of South Point, Ohio. The cabin is wood and is finished with southern yellow pine bead board. The Rufus B II was built in 1926 in Iowa. In 1991, the Rufus B II was sold to Lou Wendell Marine Sales in St. Albans, West Virginia. Many upgrades on the engines were made at this time. In 1992, the Rufus B II participated in the Tall Stacks Parade in Cincinnati, Ohio. The William D is owned by John and David Lehew. The boat was named after their grandfather, William David Lehew. The boat is constructed completely of metal including the framing. It features a bedroom, kitchen, bathroom and living room. The owners have done extensive work in renovating the William D.
https://www.mydailytribune.com/wp-content/uploads/sites/42/2017/09/web1_9.17-sternwheel-preview.jpgSternwheelers line the Pomeroy riverfront during the 2016 Sternwheel Riverfest.